my fundraising page; probably still active. If I remember correctly, they announced at the finish that the ride had attracted about 5,000 entrants (mostly riding Harleys, it seemed) and raised $1.4M for the cause. 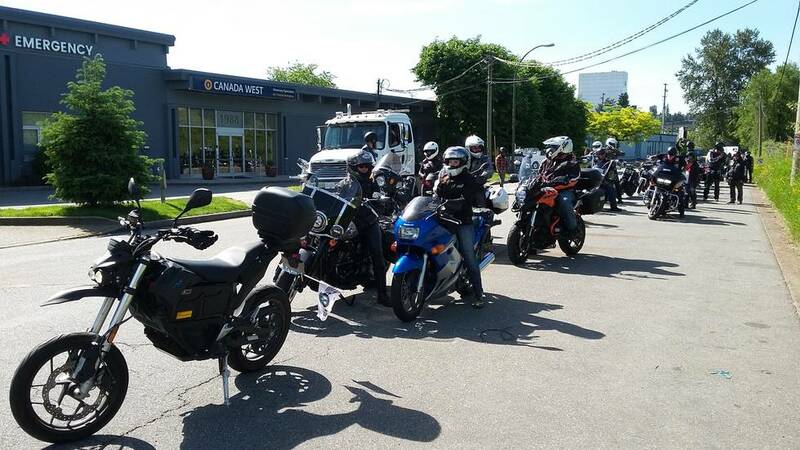 Lining up prior to start outside Trev Deeley Motorcycles in Burnaby. The line runs around the entire block (behind the camera). (frame) turning off Boundary, with the police holding back traffic. 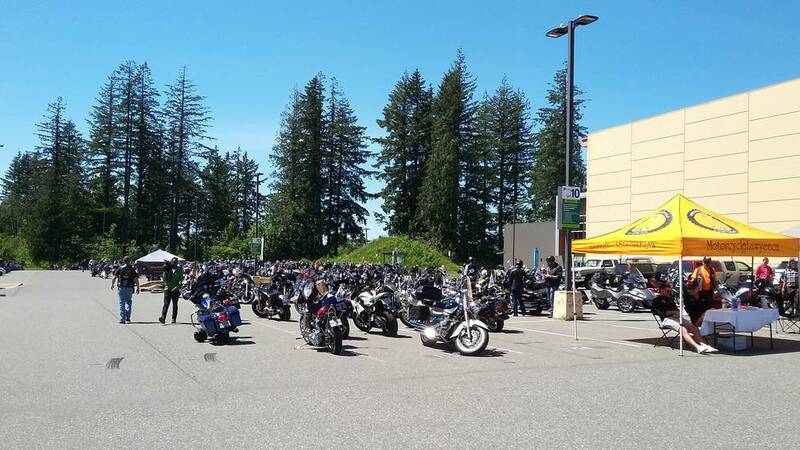 Bikes parked at the destination - University of Fraser Valley, Abbotsford. Odometer reading (km) and percent charge over time. I started out with 100% charge at home, and was down to 75% at the start location. I was able to find a 120V outlet at Trev Deeley and charge to 85% before the start. Zero estimate a 92km range for "combined city and highway". My intended route (Google maps) was about 95km one-way. I had hoped to get to 100% before starting and charge once on the way, but it was not to be. I turned off to an EV charge station in Pitt Meadows but found both spaces occupied by electric cars. I did charge for a little while using an outlet at the nearby community centre, but at only half the rate I'd get with the EV adaptor. I decided to rejoin the other riders so as not to fall too far behind, but took a wrong turn, following Highway 7 instead of Dewdney Trunk road. I skipped the detour around Webster's Corners to compensate. By the time I reached Mission, the energy gauge was getting pretty low. 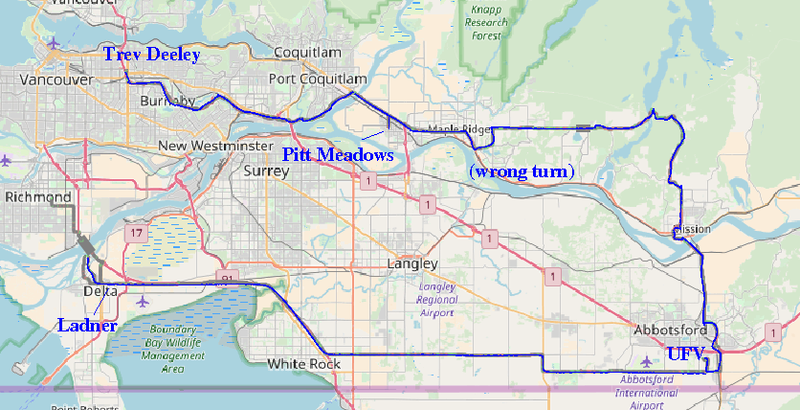 Since electric vehicles (and motorcycles in particular) use a lot more power at high speed where aerodynamic drag is significant, I slowed down to about 40kph through Abbotsford. Approaching UFV, the gauge was reading zero but the bike kept going a few more kilometres, finally quitting about 50 metres short of the UFV entrance. It was quite easy to push it to the finish and then on to the EV charge station in UFV parking lot 10. After lunch the bike had acquired only about a 35% charge so I helped with cleanup, folding up tables and chairs and taking down tents. When just about everyone had left, I had a 65% charge, and hoped that would get me home if I did not take the highway at 90kph. I rode steadily along 12th Ave at about 60 kph, ending up on highway 99 which is by far the shortest way around Boundary Bay. Again the gauge was showing very low so I came off the highway onto Ladner Trunk Road, and made it to the Co-Op gas station where I was able to use a 120V outlet and buy some snacks. I then moved to a marina in Ladner where I was able to run both chargers on two 120V outlets, and acquire enough charge to get home. 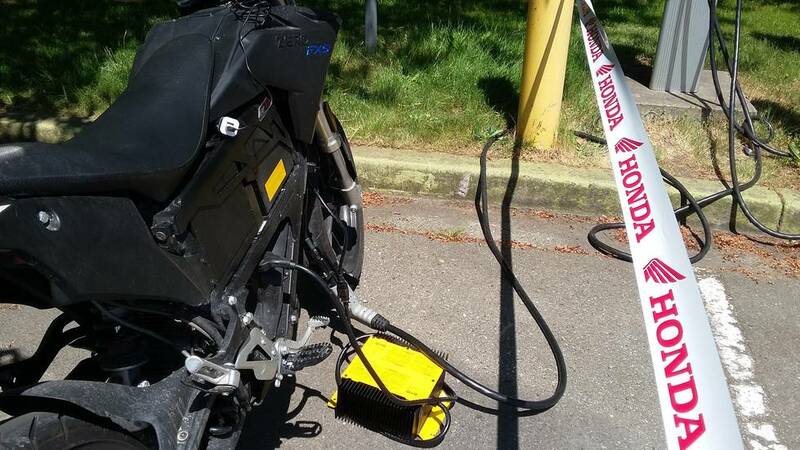 Charging the Zero FXS at UFV, on the ChargePoint networked EVSE. This is using an external 1kW charger in parallel with the built-in charger, with an SAE J1772 adaptor. The adaptor includes circuitry to emulate an electric car, turning on the EVSE.